Kat Martin's Maximum Security series is off to a wonderful, action-packed beginning! When I picked up this story I had no idea I would be following a heroine as she braves Colombian jungles in the hopes she could rescue her big brother. The Conspiracy is a fast paced romantic suspense that fully engages you and keeps you on your toes. When she can't get in touch with her brother while he's on vacation in the Caribbean, Harper Winston turns to the one man she knows will help her. With a family history of law enforcement and military service Chase Garrett doesn't want anything to do with the Winstons because of their father's criminal activities. However, for the sake of his former friendship with Michael he agrees to help Harper. The story doesn't begin and end with the extraction of Harper's brother from Colombia. Once back home Harper contends with the DEA going after her father and an invisible player gunning for her life. Her relationship with Chase is hot and cold which draws their romance out and really makes you wonder where they'll end up. Time after time, Harper proves that she can handle whatever is thrown her way. She also proves to be my favorite kind of heroine: strong, independent, and caring. I love the layers that create this story because you don't know how things connect until they do. 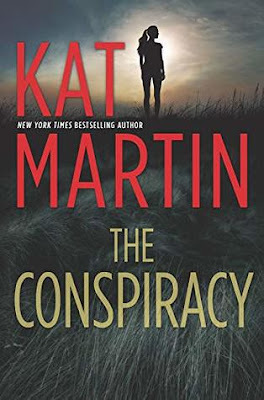 With a few twists and turns to keep readers invested in the story The Conspiracy exceeds expectations. I highly recommend for fans of Christina Dodd's Cape Charade series, and Marissa Garner.